There are 6 trios in the Pop Art Craze collection. Although they're all bright colors and eye-catching, I went for the two that stood out the most to me: I'm Seeing Triples and Your 15 Minutes Aren't Up. I'm Seeing Triples comes with a lime green, a bright blue, and a mauvey pink. They're all matte, as I think the entire collection is, and mattes can be difficult to work with. I'll get into that in a minute. Your 15 Minutes Aren't Up has a pale yellow, a bright purple, and a medium pink. You'll notice I swatched these over a white base (NYX Jumbo Eyeshadow Pencil in Milk). 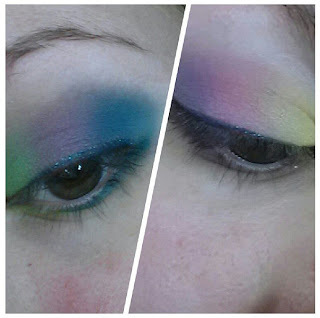 I don't usually do that as I want you guys to see the eyeshadows' performance without any help, but these guys need help. They're not BAD, but to get full color potential out of them, they definitely need a base. The bright blue in I'm Seeing Triples is pretty good on its own, but the other 2 colors are too powdery to work with without a base. The shadows in Your 15 Minutes Aren't Up vary in texture - the yellow is very creamy whereas the purple and pink have a drier texture to them. As you can see, they are vibrant and blend really nicely, they just need that added help from the base!